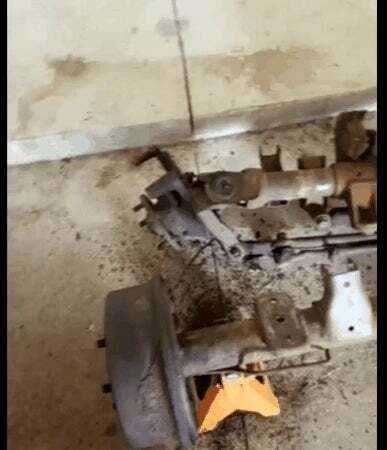 Doing an axle swap on our Jeep, since the stock gearing is 3.07 and I found a set of axles with 4.11 gearing that are a bolt on (front is Dana 30, rear is Dana 35, same as our current). Before attaching though, they need some work. The diff is perfect for having 129k miles, almost no lash at all, and seals are great. Brakes I planned to redo entirely, wire wheel all the rust off, and apply a nice coat of POR15 to the axles when done. I wanted to replace every spring, cable, connection in the drums, since they were over 20 years old, and I don’t want to have any problems. So, step 1, repeat until free. Turns out it would not be free, because the retaining springs were broken, meaning the shoes were pushed against the drum and Clarkston style hammering would not break them free. So, new shoes, drums, springs, retainers, parking brake cables, master cylinder,etc later, all for about $200. But holy crap it took A LOT of fighting to get everything to line up. How the hell does someone invent something so complicated compared to disc brakes? Yes yes I know drum brakes have advantages, but still, holy complex design.